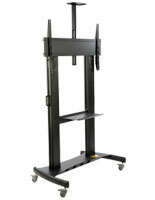 These Affordable TV Stands On Sale Advertise Products and Services Anywhere! 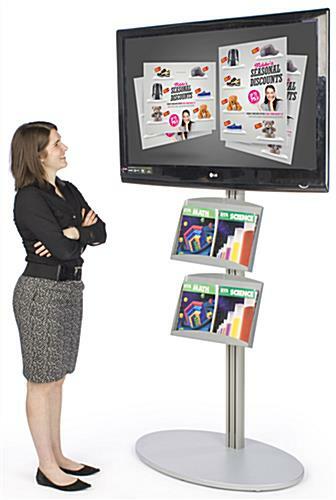 These TV Racks are Portable Advertising Tools that Combine Video Advertising with a Brochure Display! 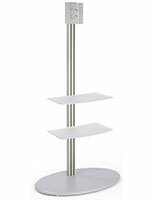 (2) Metal trays on front of plasma TV stand for holding brochures or magazines. 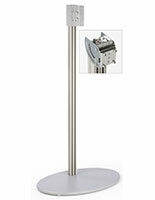 Tilting mount allows you to angle plasma or LCD TV for best view. 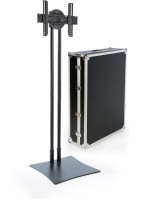 Plasma TV stand holds 32" to 42" plasma or LCD television weighing less than 70 lbs. 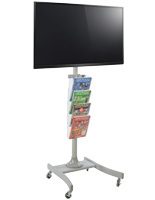 This TV stand, also known as an LCD stand and a monitor stand, has an optional tilting mount available. You can use this mount to angle your television to provide the best view. The TV stand has (4) plastic strips that you can place in channels along the back of the display to help hide wires. 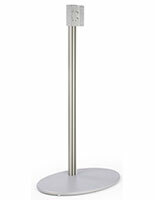 A monitor stand, TV stand has a satin silver finish that easily blends in with most surroundings, while the large rounded MDF base provides stability in heavily trafficked areas. This TV stand is normally used in malls, retail stores, offices, convention centers, and even airport lounges. This TV stand has (2) metal pockets that mount onto the front of the television stand. These pockets are wide enough to accommodate (2) standard sized magazines or (4) standard sized brochures. The TV stand uses adjustable pockets for best positioning your additional information. 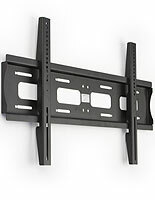 An LCD stand, TV stand has a VESA bracket that has been designed with manufacturers to fit most televisions. We include the necessary hardware to fit most televisions, though some may need specific screws you can buy at most hardware stores.